Top: 10 series and 21 series trains on the Midōsuji Line. Bottom: A 30000 series train on the Tanimachi Line. 137.8 km (85.6 mi) (incl. Osaka Metro (Ōsaka Metoro) is the rapid transit network in the Osaka Metropolitan Area of Japan, operated by Osaka Metro Co., Ltd. (大阪市高速電気軌道株式会社, Ōsaka Kōsoku Denki Kidō Kabushiki-gaisha, lit. “Osaka Rapid Electric Tramway, KK”). It serves the city of Osaka and the adjacent municipalities of Higashiosaka, Kadoma, Moriguchi, Sakai, Suita, and Yao. Osaka Metro forms an integral part of the extensive mass transit system of Greater Osaka (part of the Kansai region), having 123 out of the 1,108 rail stations (2007) in the Osaka-Kobe-Kyoto region. In 2010, the greater Osaka region had 13 million rail passengers daily (see Transport in Keihanshin) of which the Osaka Municipal Subway (as it was then known) accounted for 2.29 million. Osaka Metro is the only subway system in Japan to be legally classified as a tramway, whereas all other subway systems in Japan are legally classified as railways. Despite this, it has characteristics typical of that of a full-fledged metro system. Until March 31, 2018, the network was operated by the Osaka Municipal Transportation Bureau as Osaka Municipal Subway, and was the oldest publicly-operated subway network in Japan, having begun operations in 1933. A proposal to privatize the Osaka subway was sent to the city government in February 2013 and was given final approval in 2017. The rationale behind privatization is that it would bring private investors to Osaka and could help revive Osaka's economy. The new private operator took over operations on April 1, 2018. 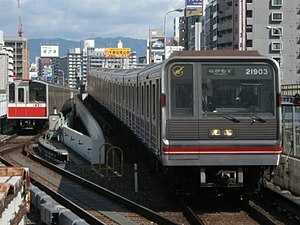 The network's first service, the Midōsuji Line from Umeda to Shinsaibashi, opened in 1933. As a north-south trunk route, it is the oldest and busiest line in the whole network. Both it and the main east-west route, the Chūō Line, were later extended to the north and east, respectively. These extensions are owned by other railway companies, but both Osaka Metro and these private operators run their own set of trains through between the two sections. All but one of the remaining lines of the network, including the Yotsubashi Line, Tanimachi Line, and Sennichimae Line, are completely independent lines with no through services. The lone exception is the Sakaisuji Line, which operates through trains to existing Hankyu Railway lines and is the only line to operate through services to existing railway lines that are not isolated from the national rail network (which is the case with the Midōsuji and Chūō Lines). Nearly all stations have a letter number combination, the letter identifying the line served by the station and the number indicating the relative location of the station on the line. For example, Higobashi Station on the Yotsubashi Line is also known as Y12. This combination is heard in bilingual Japanese-English automated next-station announcements on board all trains, which also provide information on local businesses near the station. Only Hankyu stations served by the Sakaisuji Line do not follow this convention. Osaka Metro stations are denoted by a white-on-dark-blue icon placed at ground-level entrances, depicting an "M" (for "Metro") based on a coiled ribbon, which would form an "O" (for "Osaka") when viewed from the side, with the "Osaka Metro" wordmark set in Gotham. "Osaka Metro" (in Latin characters) is the official branding in Japanese, and is always represented as such in official media. (News outlets have been seen to use 大阪メトロ, presumably to better flow with article text.) Individual lines are represented by a public-facing name (e.g. “Midōsuji Line” for Line No. 1) and a specific color, as well as a single Latin letter, which is paired with a different number at each station for easy identification (see below). Icons for each line (featured in station wayfinding signage) are represented by a solid roundel in the line color, superimposed with the line’s letter-designation in Parisine. An older branding (also used on the tram network run by the city until 1969) is the “Mio-Den” mark, which depicts an old-fashioned depth-marker, (澪標, mio-tsukushi), the logo for Osaka City, over the kanji for electricity (電, den), short for “electric train” (電車, densha). This mark is still present on newer trainsets and staff uniforms as a connection to the subway network’s roots. When it was run by the Osaka Municipal Transportation Bureau, the subway used a logo known as the “Circle-Ko” (マルコ, Maru-Ko) symbol, which is a katakana “ko” (コ) for “transport” (交通, kōtsū) superimposed over a circular capital “O” for “Osaka” (see infobox, above). This remains on many trainsets and at stations, but is slated for replacement with the Osaka Metro logo as the changeover progresses. Currently, there are eight lines, operating on 129.9 kilometers (80.7 mi) and serving 123 stations; there is also a 7.9-kilometer (4.9 mi)-long, 10-station automated people mover line known as the "New Tram". In addition, there are five line extensions and one new line that are planned. However, on August 28, 2014, the Osaka Municipal Transportation Bureau met about creating the extensions of the later five of the six lines listed below, and have stated considering the current cost of the new extensions (and the possibly of privatization at the time), the government has also considered using light rail transit or bus rapid transit instead. Osaka Metro is now experimenting with bus rapid transit on the route of the Imazatosuji Line extension, with “Imazato Liner” service between Imazato and Yuzato-Rokuchōme slated to begin in April 2019. With Osaka being the host of Expo 2025, there are also plans to extend the Chuo Line northwest onto Yume-shima (the event's planned site), with a terminus on Sakura-jima north of Universal Studios Japan. Provisions were put in place for such an extension when the existing road tunnel between Cosmosquare and Yume-shima was built, but the current state of the artificial island (with only industrial facilities and a lone convenience store for workers) meant it would have been unlikely to proceed had Osaka lost its bid. Osaka Municipal Subway rolling stock use two types of propulsion systems. The vast majority of lines use trains with conventional electric motors, but the two newest lines, the Nagahori Tsurumi-ryokuchi Line and Imazatosuji Line, use linear motor-powered trains, which allow them to use smaller trains and tunnels, reducing construction costs. These two lines have half-height automatic platform gates installed at all station platforms, as does the Sennichimae Line. Also, unlike other rapid transit networks in Japan, most Osaka subway lines use a third rail electrification system for trains. Only three lines use overhead catenary: the Sakaisuji Line, to accommodate through services on Hankyu trackage; and the linear-motor Nagahori Tsurumi-ryokuchi and Imazatosuji Lines. Also unusually, all lines use standard gauge; there are no narrow gauge sections of track due to the network being almost entirely self-enclosed. Osaka Metro charges five types of fares for single rides, based on the distance traveled in each journey. Some discount fares exist. On April 8, 1970, a gas explosion occurred during the construction of the Tanimachi Line at Tenjimbashisuji Rokuchōme Station, killing 79 people and injuring 420. The gas leaked out from a detached joint and filled the tunnel and exploded, creating a fire pillar of over 10 meters and destroying 495 houses and buildings. ^ a b c d e f g h i j k 営業線の概要 [Overview of operating lines] (in Japanese). 大阪市営交通局 [Osaka Municipal Transportation Bureau]. Archived from the original on January 11, 2014. Retrieved June 7, 2014. ^ "交通局の予算・決算について" [For budget and balance sheet of Transportation Bureau] (in Japanese). 大阪市営交通局 [Osaka Municipal Transportation Bureau]. Retrieved December 18, 2014. ^ Kokudo Kōtsū Shō Tetsudō Kyoku (2005). Tetsudō Yōran (Heisei 17 Nendo) (in Japanese). Tokyo: Denkisha Kenkyūkai. p. 228. ISBN 4-88548-106-6. ^ "公営地下鉄在籍車数ビッグ３　大阪市交通局 (One of the big three public subway operators: Osaka Municipal Subway)". Japan Railfan Magazine. Vol. 49 no. 576. April 2009. pp. 88–99. ^ Rogers, Krista. "The most crowded train lines during rush hour in Tokyo, Osaka, and Nagoya are…". Rocket News 24. Retrieved September 8, 2014. ^ 大阪府内で働く人の通勤時間は「52分」――理想の路線は？. bizmakoto.jp (in Japanese). September 9, 2014. Retrieved September 8, 2014. ^ 地下鉄４線延伸「採算厳しい」　有識者審議会. Yomiuri Online (in Japanese). August 29, 2014. Retrieved September 1, 2014. ^ "Osaka subway's Sennichimae Line to have platform screen doors installed in every station Chinese translation to follow". Asian Public Transport. February 13, 2014. Retrieved September 8, 2014. ^ a b "Tickets". Osaka Metro. Retrieved April 14, 2018. ^ 市会のあゆみ. Osaka City Council Website (in Japanese). Retrieved August 3, 2014. ^ Pulvers, Roger (November 4, 2012). "Beware the parallels between boom-time Japan and present-day China". The Japan Times. Retrieved August 3, 2014. ^ "Gas Explosion at a Subway Construction Site". Failure Knowledge Center. Retrieved August 3, 2014. Wikimedia Commons has media related to Ōsaka Metro. This page was last edited on 10 February 2019, at 01:58 (UTC).